For the 24th door of Konzeptfussball’s Advent calendar, I thought it would be interesting to expand upon a topic which is often overlooked in coaching. A lot of coaching is done on organized phases of the game such as: goal kicks (build up and high pressing), corner kicks, free kicks, and throw ins. Other organized phases can arise throughout the match such as midfield or low pressing in defensive organization and possession in midfield or finishing attacks in offensive organization. This article was originally published on KonzeptFussballBerlin.de on December 24th, 2017. KonzeptFussball is a German tactical-analysis website with a close connection to Spielverlagerung. It was the last piece in their “December Special,” where they posted a new coaching article every day from December 1st to December 24th. These are all moments of the game where, if coached properly, the team can move into its pre-planned strategy during the game more easily. This is because organized phases of the game are more predictable (hence the name) and are easier to prepare for in training using explicit patterns that will transfer to the real match. However, most of football is happening in unorganized phases. These unorganized phases must be controlled properly if a team is looking to enter more organized phases. For example, if you are trying to enter true “possession in midfield,” this is not possible unless the team can control the opponents high pressing and pressing in unorganized phases. If these cannot be controlled/broken-through, an opponent will never drop off into an organized midfield or low block where the possessing team has more time and space. Time and space is the key component that results in organization. This article will be more about the concept and teaching of it, rather than a special or unique drill for the given topic. I am talking of course, about transition phases. This not only means counter-attacking and counter-pressing, but in a more detailed sense it refers to loose balls and clearances. Clearances are happening very often in every game of football regardless of which team you are or which level you play at. Guardiola’s Barcelona had to control opponent clearances, long crosses, set pieces, and their own clearances. Even though they are known for playing possibly the best football in history, none of it would be possible if they were not capable of controlling these “less beautiful” phases of the game. Most attacks fail to create a goal, therefore the opponent gains possession of the ball often in one game. This is natural due to the difficulty of controlling a ball with one’s feet as opposed to hands (basketball), for example. That means that any opponent at any level has the possibility to at least play long passes, long crosses, set piece crosses after fouls, and occasionally an attack built all the way into opponent penalty box. These frequent phases result in a lot of duels from high and loose balls. A very common response to one team’s long high pass is for the defending team to immediately clear the ball out of the defensive area, rather than try to control the ball and build a possession in a dangerous situation. What is the common reply to a clearance after a long high pass? You guessed it! Another clearance. This results from both teams avoiding a long and high ball dropping near their defense as they can be hard to control. 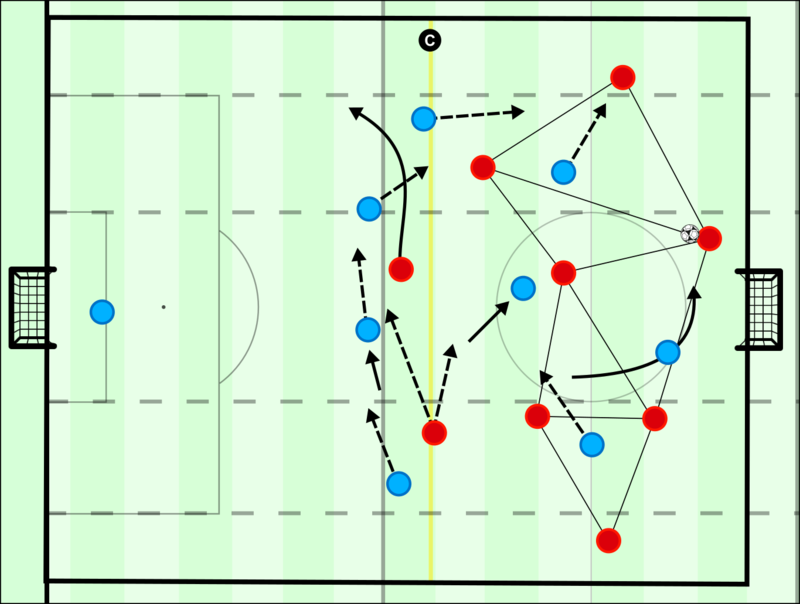 A chain of clearances typically continues until a team can calmly receive the long and high pass to bring it down and play to a teammate to gain control of the ball while having time and space. Another common end for these chains is if one team wins its own clearance toward its strikers, this forces the opponent to drop back toward their own goal and thereby creates time and space for the offensive team. Needless to say, this results in a chain of duels for the ball. The chain is broken in cleanly winning a loose-ball duel, playing a controlled pass to break opponent pressure, and dribbling out of pressure to maintain possession. This all means that the team in possession has now space and time on the ball – and time allows for the players to move into their organized positions to allow the organized plan to commence. Time and space are interchangeable, as when you have time you have space, and when you have space you have time. Space is simply the absence of an opponent player. Meaning if you play into a spacious area there is no opponent and more time for organization. Because of this, back passing to the halfway line (if the opponent is in a deeper block) or the goal keeper (if the opponent is in a higher block) is a crucial tool to create more time for the team to organize (while giving up some spatial progression) before the opponent is capable of moving players closer to the ball once again. Players who can dribble and pass under pressure, find their wide starting positions quickly in possession, and compactly press the ball quickly when out of possession are therefore extremely valuable if the coach is seeking to play in more organized phases during a match. Nearly every game of football will have the opponent create at least 1 chance, this happens even to the greatest teams. It’s about controlling this chaos as well as possible in your favor. A lot of failures happen in every phase of football to every team, no matter what the level is. Even peak Barcelona lost the ball in build-up from goal kicks as the ball went out of bounds or got turned over, but it’s how they reacted to these unbalanced phases that is important – because everything keeps moving. As an example, Guardiola’s teams are by far the ones with the most offensive organization – this is not possible if they can’t build up with their goalkeeper under high pressure, or put high pressure on the opponent to turn over the ball. Because they force turnovers from the opponent and refuse to be turned over themselves, opponents eventually submit to the dominance of the possession team and drop deeper to protect their goal rather than to attack the ball. This creates time and space for the team in possession which allows for them to enter an organized attack. This allows Guardiola to be more often accurate in his game-planning because his team is most often in organized phases so his practiced patterns are more often and in realistic situations. This gives players confidence and awareness on what to do which adds speed and stability. Other coaches might have the same thinking but not enough game control for their plans to come into reality. These coaches should focus more on unorganized phases and on more general concepts and principles. This doesn’t seem as “complicated” as explicit instructions in an organized pattern play in all phases, which makes some coaches seem more detailed than others even if they are less effective. A great coach would understand the nature of football to create a good plan, train it realistically, and have a realistic analysis of the opponent’s behavior and what will most often occur within a match. What is the key reason that goal-kicks, free-kicks, corner-kicks, and throw-ins are so organized then? It is because when these moments happen there is ample time for the teams to organize their positions before the play restarts. Coaches who are often seen as having a huge impact immediately, are ones which are focusing a lot on organized phases and allowing for them to happen – thereby it is more often clearly visible the work of the coach, where a coach who works on principles of play which are more implicit or during the unorganized phases is typically less appreciated. For example, many would (correctly) argue that a coach like Tony Pulis has an immediate impact on his teams as soon as he takes over. This is in large part because his teams play in a deep block – giving time and space to the opponent but also organizing one’s own block and beginning to defend from there. His team also focuses a lot on corner-kicks, free-kicks, throw-ins, and goal-kicks. From these moments, they are capable of not only defending a lot of situations, but attacking from them. This gives a higher stability to his teams in a sense and the organization is immediately apparent – as opposed to him trying to play a possession game under pressure where his players would have to adjust to various presses and dribble/pass under pressure to create time and space on the ball, or high press and counter-press opponent build-ups to regain control of the ball. If you try to dominate the game but do it poorly, you will be unorganized and exposed as you lose duels – if you give up some control of the game, you give time and space to both teams for organization. In youth football, both teams typically want to get the ball, but both aren’t at a high level when trying to achieve this. They press to win the ball back, but are played through. They pass or dribble under pressure, but lose possession. They move into clearances and loose ball duels, but fail to win the duel. So, it happens less often that these teams can enter a more calm and clear possession of the ball. As the offensive team, you’d ideally like to keep the ball and progress in a controlled manner. This is difficult if you cannot exercise dominance in the above-mentioned moments. Therefore, it is very important to work on a (counter-)pressing mentality to create pressure and a dribbling/passing mentality under pressure. In the end, it results in more organized attacks for your own team while the opponent has very few organized attacks. Games which involve tight spaces allow for immediate and compact pressing. This is the fundamental component in forcing clearances, where a team would not only have to win the opponent’s clearance, but also their own if they are under pressure. Players will have to learn not only how to immediately press and fight for dominance without the ball, but how to dribble and pass under intense pressure to break the opponent pressure and create time and space on the ball. Once these aspects reach a high enough level, the team can begin to exercise dominance over an opponent. No matter how good your team is, they must be able to attack and defend in unbalanced phases in a game due to the ease of turnovers in football mentioned earlier. Free teammates are often found in deeper and wider zones. Therefore, passes along the back line or passes in the backwards direction can create time and space for organization, depending on the opponent defensive organization. Real Madrid is an example of a team which overloads these zones and only leaves 3 attackers forward to circulate the ball and dominate the opponent before choosing a way forward. This will be one of the important coaching points. When coaching, the important details to ingrain to the players is their positioning, their scanning, their decision making, and at least the style of their execution (high or low intensity). Which direction should the players scan and when? Which decisions should they prefer to make? How should they communicate between one another to make these situations easier to deal with? The ball is always free in the game of football, it can be turned over at any moment. Players must learn how to make decisions in an unorganized environment as good as possible. The coach helps this process by working on the individuals within the team and working on principles of playing, or a general decision-tree as guidelines as opposed to and explicit approach to highly chaotic and unorganized phases. An excerpt from FC Barcelona’s methodology applies well here: “In recovery [defensive] phase, always a step forward. In possession [offensive] phase, always a step backwards.” This implicitly teaches players to fight for dominance of the game and create an organization. One’s organization should inevitably include triangles/diamonds for better coverage and support out of possession, and better support and progression in possession. Compactness in and out of possession is another crucial aspect in pressing/escaping pressing. When looking at counterpressing specifically, it is useful to press immediately as the opponent who won the ball typically has a bad field of vision and needs time to regain his awareness and balance, making it an ideal moment to regain possession of the ball or force the opponent into a clearance. The players must anticipate situations where the ball can be lost and move towards there with speed, and if it is lost they should move at full speed to increase pressure of time and space on the opponent as high as possible. The whole team (players ahead and behind the ball) must move together toward the ball for pressure and cover – leaving farther spaces open to increase pressure on the ball. In this drill, it’s important to consider the structure, as it is the base position for the actions. Ideally the teams are set up in a compact shape while still having players to pass to in deeper and wider zones once the possession is regained. These are created from having a minimum of 3 lines with no more than 3 players on a single line – while ideally remaining symmetrical to the number of players in the first and last lines. The drill can be adjusted for the number of players by increasing the size of the field – it is quite a versatile and simple drill (as it is very close to a full game) where it is easy to add in players or take away players based upon one’s training squad for the day. The entire focus of the drill is the ball: Can you get it? Can you keep it? Coaches should focus on being energetic, encouraging fast and aggressive defending attempts as well as quick and tight dribbling or passing attempts under pressure to gain control. Many mistakes will inevitably happen but if you continue to encourage the players they will continue to improve and understand mistakes in a different way. The coach must also be aware of the offside line. The need for clearances is created naturally by creating high pressure situations near the opponent goal – they will either break the pressure, lose the ball near the goal, or clear the ball. This creates more pressure on time and space, inevitably giving us more turnovers and unorganized phases. The players should begin to form the habit of “attacking” through all phases to keep progress and control the game. This is relatively instinctual for youth players – we have all seen the very young ages where every player constantly sprints at the ball to have it as long as possible. Coaching is done over the flow of the game with encouragement and quick, concise points or in stoppages caused by the coach (freezing the game), the ball going out of play, or a rest break due to the time of the exercise expiring. The size of the drill depends on the number of players, but in this specific case I like to do it in about a ¾ field to have depth to defend (offside rule is active) while more easily pressing high and to attack with potential long passes behind or spread out the opponent press with back-passes. The width of the field should be narrower to promote counterpressing, more duels, and quick and tight attacking play under pressure. I prefer to play this drill in an 8 vs. 8 format. I use this as the main part of the training before moving to the full game. The drill time can be extended based upon needs, but for intense pressing, dribbling, and passing I prefer to lower the playing time (even though the bigger space demands a lot already from the players) and give more frequent short breaks from play. At least 5 minutes of playing and 2 minutes of resting allows for the drill to function properly. The game will include common organizational moments: goal-kicks, corner-kicks, free-kicks, and throw-ins to add in the potential of not only playing these moments in an organized way, but to constantly threaten the area close to the opponent goal with set-pieces. This will cause more clearances and duels for loose-balls. The context of these actions can be described by answering the following: Who, What, When, Where, Why, and How? Context is important to be able to make the instructions for the players better. Everything you do as a coach is to improve individual perception and decision-making. Everything comes from what the player sees and thinks – and they should be talked to in this context. The football field is a field of information, players must perceive the information, then interpret the information using guidelines, then analyze the situation to decide, and then execute the decision. Regarding execution, the cleanliness [quality], amount [quantity], and how often [frequency] play into how these actions are rated, along with their speed. When the opponent central defender or goalkeeper is passing the ball across the defensive line, attack the receiving ball player with speed diagonally in front of you. When the player on the ball has time, and is facing forward with the ball against the high press, give a passing option behind the opponent high defensive line. These instructions contain details of the action as well as the action itself. The players will learn where they should scan before they move to press, their direction of running compared to their body position, the timing of the actions, their ideal positioning, and more. An overall goal is made up by a series of instructions. An instruction is the goal of 1 action. These instructions are taught and delivered not (only) explicitly, but implicitly through the training drill. As you can see in the example instruction I used for pressing, this does not even cover the details of handling clearances or other main points of the exercise. A coach should have the overall goal in mind while having created many detailed instructions for each specific topic within the overall goal to transfer to the players in time. Can the opponent play to the left? Would you coach/talk to your teammate? Would you coach his movement-direction? Which direction would you coach him? And then you arrive at the instruction (teaching players to guide teammates pressing direction based upon possible actions of the opponent) itself as the result of the questioning. The questions are not only based upon what the player sees, but also what he is thinking – a skilled coach can often deduce the thought process of a player, and guide them on how to improve the thought process. This results in individuals becoming more aware and understanding, so they can improve. I would like to touch upon again the topic of organization and disorganization to finish this 24thdoor off. When comparing the two in modern football, there seems to be a larger focus on organized phases. Disorganization is easier to create and harder to prevent. Guardiola’s teams are often dominant because they have the best organized offense and force the opponent almost constantly into an organized defense. One should consider training their team in the principles of disorganization while forcing opponents almost constantly into a phase of disorganization. This would cause a different process and style regarding dominating a game, as the goal is no longer to enter constant organized phases, but attack the opponent through disorganization. By AdinOsmanbasic in All Articles, Training Methods on December 26, 2017 .